Recently, my little sister asked why all the crafts I post on my blog are super easy. "Why don't you do a real craft sometime?" she said. You got me, Emma! She's totally right. I do post easy crafts. It's all I can do! I don't have a huge crafting budget, I don't have the patience to do anything that can't be done during afternoon nap time, and I've sworn off the sewing machine ever since I made Emma a baptism dress and almost pulled all my hair out in the process. (I have since realized that pre-sewn clothes are one of the greatest conveniences of the twenty-first century and vowed I will never again touch a sewing machine.) With me, the easier and simpler the craft, the better! And so I bring to you the latest product of afternoon nap time: a Valentine's clothespin wreath! 1. Cut out a one-inch thick circle of cardboard. I laid a mixing bowl upside-down on the cardboard and traced the outline of the bowl. Then I used a smaller bowl to trace the inner circle. Cut out the inner circle so you're left with a one-inch wreath-shaped circle. 2. 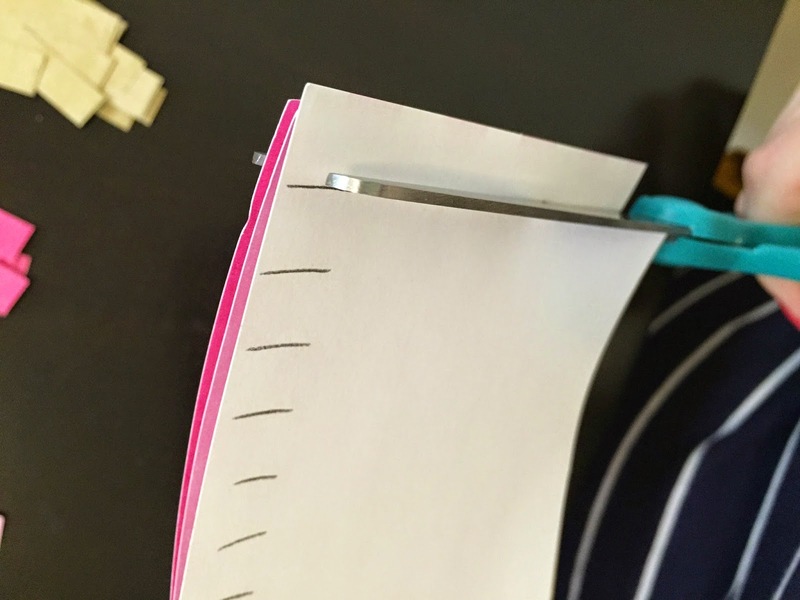 Cut the scrapbook paper into strips the size of a clothespin. To do this, I measured the width of a clothespin and marked off tick marks with a ruler. Then I cut all four pages at once - I'm all about doing the easiest thing, remember? 3. 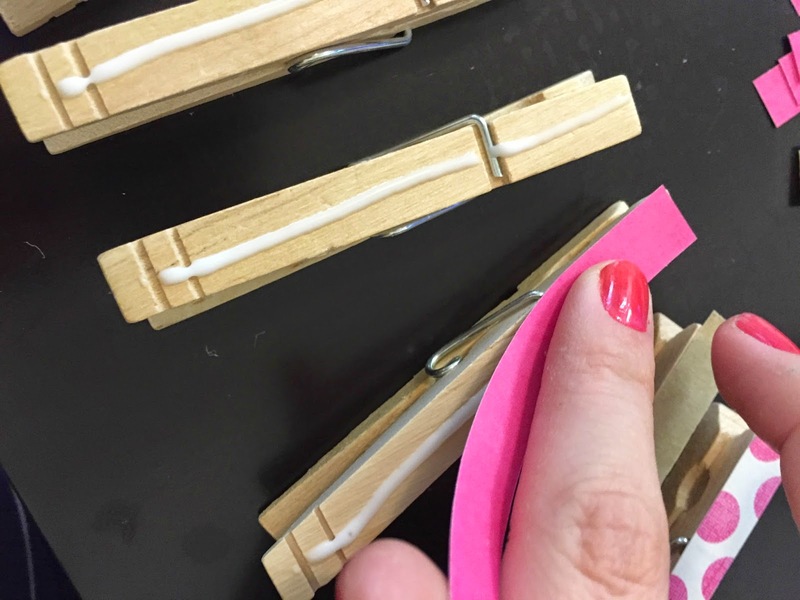 Glue the scrapbook paper strips onto your clothespins. I dabbed a thin line of glue on about eight at a time. Press and hold for a few seconds to cement the seal. You could also use mod podge, glue dots, or any other type of glue! 4. 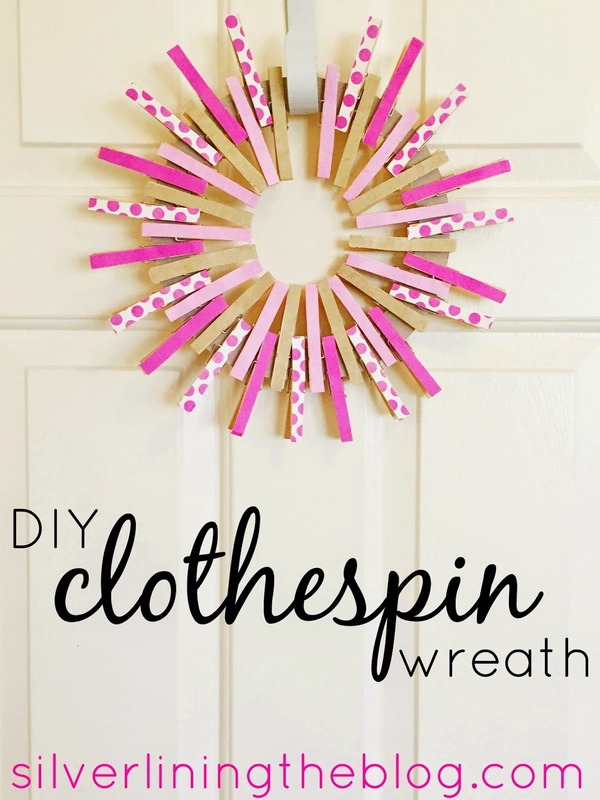 Clip the dried clothespins onto your wreath, alternating sides. Clip the first one to the inside of the circle, and the next one on the outside of the circle. Inside, outside, inside, outside. 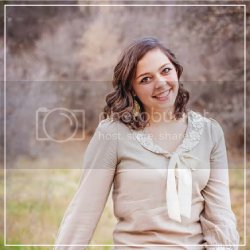 This will give you the cool sunburst look. It's also aesthetically pleasing. It's also been proven to reduce the risk of heart disease. 5. Add optional decorations, and you're done! I took off one clothespin at the top to make room for the wreath hanger. + Buy two sets of scrapbook paper. That way, you can put St. Paddy's Day paper (or whatever holiday you want) on the reverse side of the clothespins. All you have to do is turn the wreath around and you have another decoration! + This would be super cute with a little pink flower decal or something else to decorate the bottom of the wreath. I just worked with what I already had, but I might have to pick up something for my wreath on my next trip to Hobby Lobby. What else should I do during naptime crafting? There's nothing wrong with quick and easy crafts - it's the only ones I do. I think your Valentine wreath turned out beautifully! Who knew clothespins could be so gorgeous? Great job! You're so sweet Alli. Thank you! And yes - easy crafts are the only ones I do too! Cute wreath...clothes pins are so versatile! I love this! I can't wait to whip one together for my daughter's bedroom.